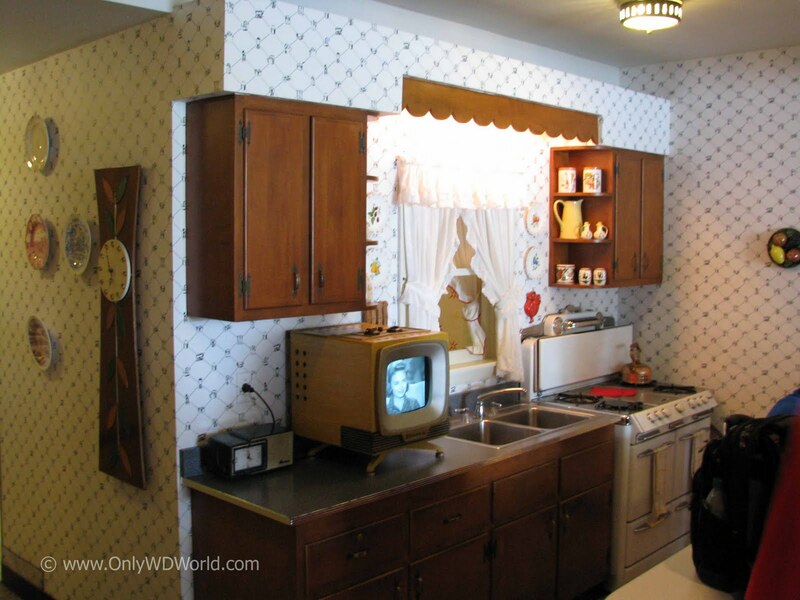 At Disney's Hollywood Studios you can have a real dining experience that transports you back to the 50's into the world of Mom's Kitchen and when the TV was still a relatively new invention. The 50's Prime Time Cafe combines detailed theming to go with a menu filled with comfort food and family favorites like Fried Chicken and Meatloaf. 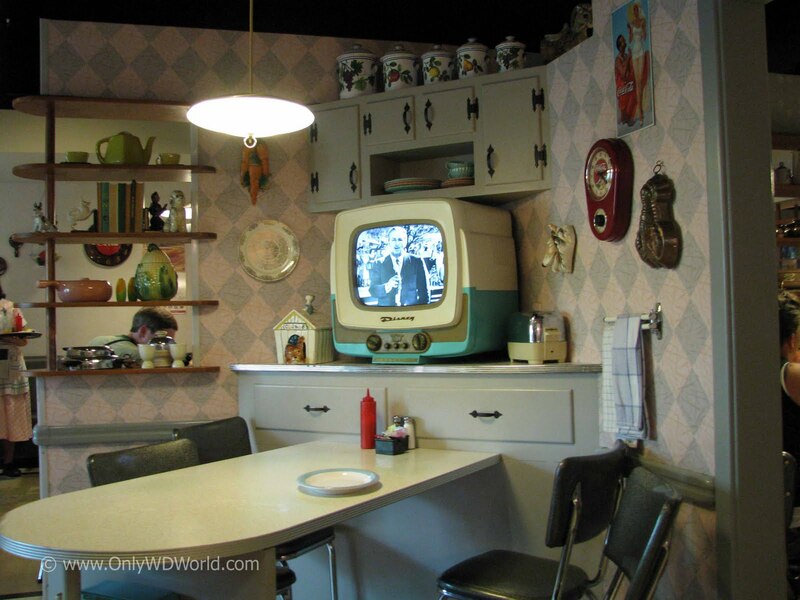 The 50's Prime Time Cafe is certainly not your typical restaurant. You get that sense before you even walk in the door. In neon lights above the door is the sign "TV at your table." 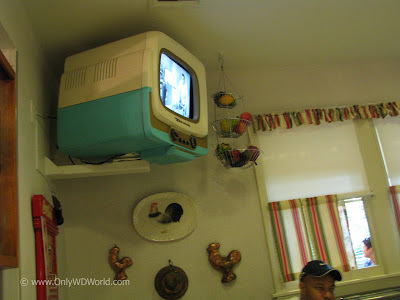 Televisions are apparent everywhere in this restaurant. From the lobby, to the waiting area, to the dining rooms. These black and white beauties only play shows and clips from 50's era programming, so get ready for wholesome family entertainment. Relaxing waiting area that is just off of the main entrance. 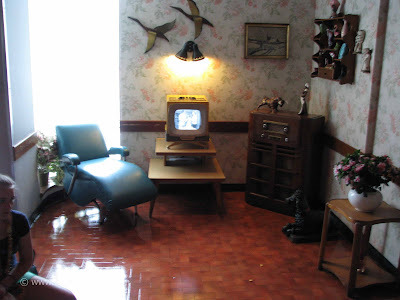 Decorated like the family room in a 50's era home. One interesting note is that all of the TV's are Disney brand. You can find this kitchen mock-up just inside the main entrance near the hostess stand. Lucky groups of 4 or less may get one of the tables that has their own TV to watch. The decor is designed to make you feel right at home, literally. 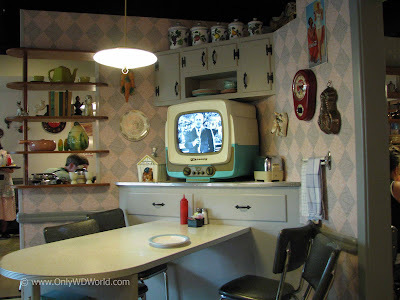 Of course you would have to transport 60 years back in time or live on the Carousel Of Progress. Here is another view inside the restaurant and the seating arrangements. 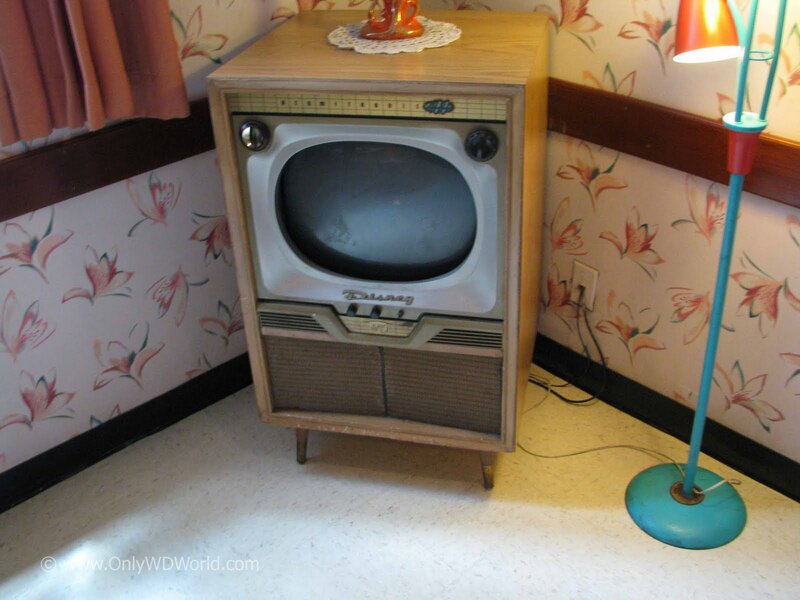 Yet another TV for diners to watch. The theming for the 50's Prime Time Cafe extends beyond the decorations. The talented wait staff is in character and will let you know if you go astray of the "House Rules." Remember to eat your vegetables and keep your elbows off of the table or you will hear about it. You also will be asked to set your own table. Have fun and enjoy the interactive theater of sorts. The cuisine is homemade American Comfort Food as the stereotypical Mom would have made them in the 50's. The specialties of the house are: Fried Chicken, Meatloaf, and Pot Roast. Don't expect fancy, gourmet cuisine, but you will get a good meal. You may also want to try the famous PB&J Milkshake that everyone raves about. 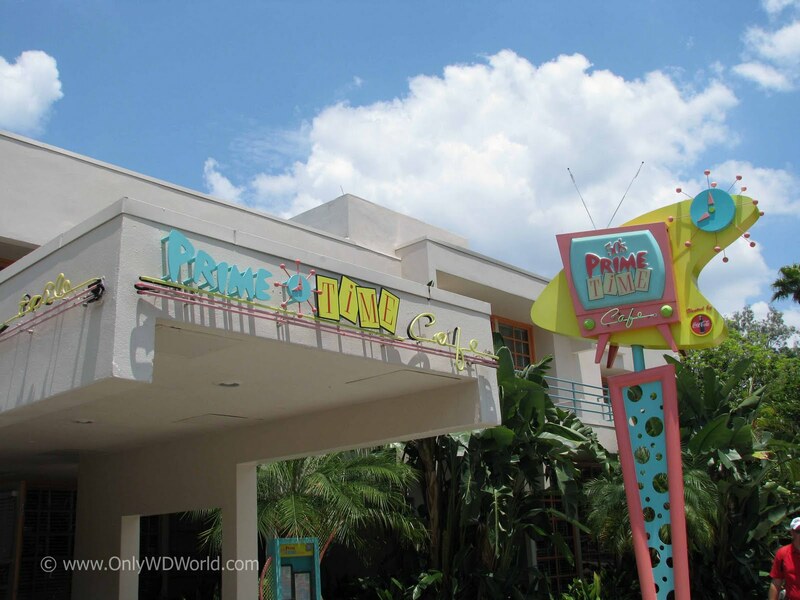 The Tune-In Lounge is connected to the 50's Prime Time Cafe and has a fully stocked bar that you can enjoy while you are waiting for your table or you can order an alcoholic beverage ( beer, wine, and mixed drinks) during your meal. 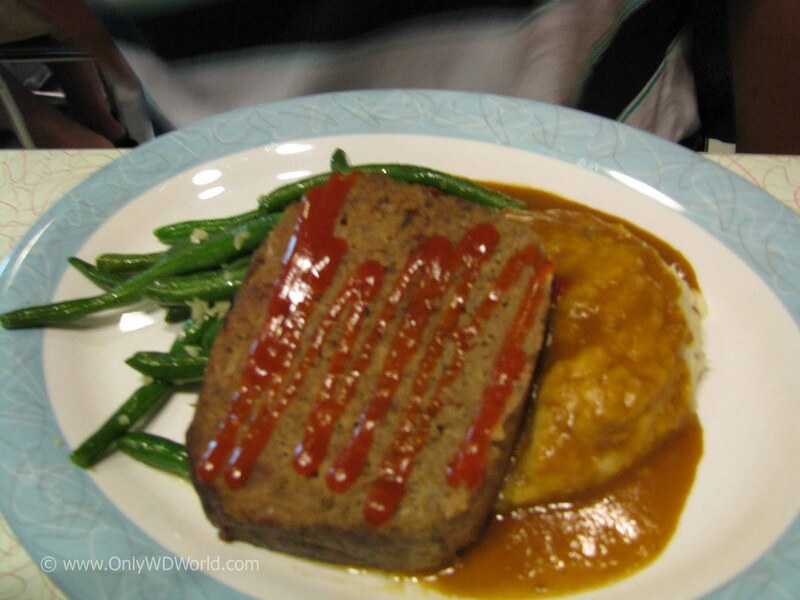 Dad's Traditional Meatloaf ($14.99) is pictured above. It is a "blend of beef and pork topped with tomato glaze served with mashed potatoes and green beans." It was a good, comfort food meal, if not the best meatloaf ever. Aunt Liz's Golden Fried Chicken ($15.99) was definitely the most popular dish. 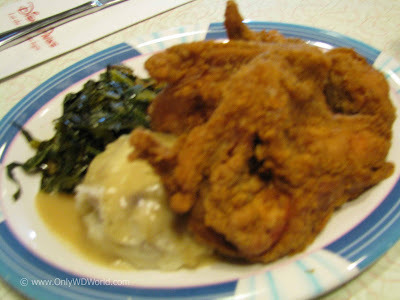 It is "served with mashed potatoes, chicken gravy, and southern greens." This was a very filling meal, so bring your appetite. The Fish Sandwich ($11.99) is a "beer-battered fillet served on a crusty roll with lettuce, tomato, and tartar sauce served with a house salad or french fries." I personally had this for lunch and was very pleased with my choice. It was a very tasty sandwich and it was quite filling. 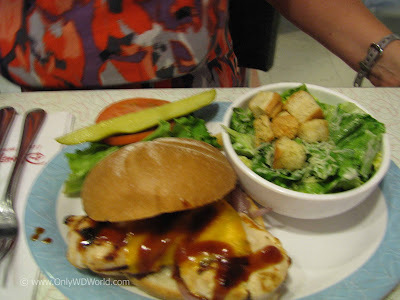 Cousin Eric's Char-Grilled Chicken Sandwich ($13.49) is "marinated chicken breast topped with cheddar, grilled onions, barbecue sauce, lettuce, and tomato on a kaiser roll served with a house salad or french fries." This is a healthier lunch option, especially when you opt for the salad instead of the fries. Again the food was tasty and the portions were large and filling. 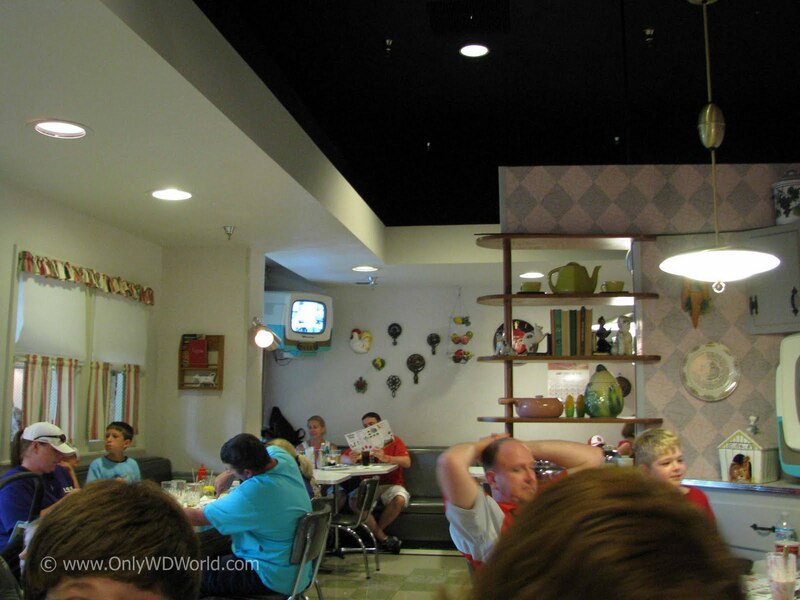 If you want to see the dessert menu at 50's Prime Time Cafe just check out the Viewmaster at the table. You can then check out each of your options. The 50's Prime Time Cafe is not the place for a gourmet meal or a romantic dinner, but it is a fun and entertaining dining option for the family when visiting Disney's Hollywood Studios. 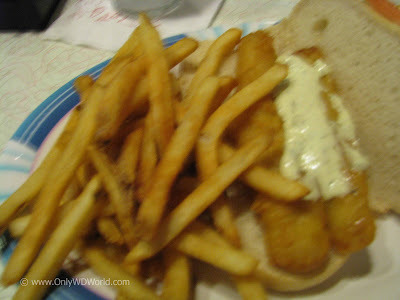 It is one of the best themed meals at Disney World. The waiter or waitress that you get can make the difference from having a good time or having a great time dining there. They play a key role in the experience and the fun. The food is good, comfort food. Know that going in and you will be fine. 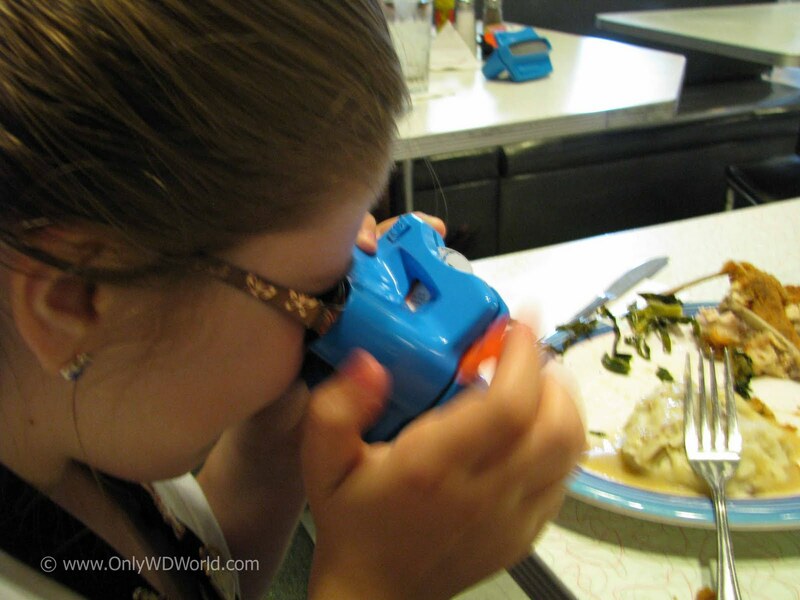 Most families will have no problem finding something on the menu that each person will enjoy. 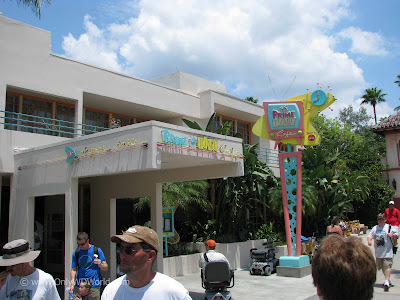 Overall this is a restaurant that everyone should experience at Disney's Hollywood Studios. This truly qualifies as an attraction as well as a restaurant. Take our advice and check it out! 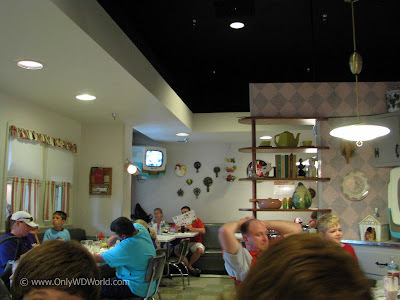 0 comments to "Disney World Dining: 50's Prime Time Cafe"